Adorn your Hens Night Crew with Personalised Hens Night Badges! Chicken Design. Size: All custom made Hens Night badges are 57mm diameter. A unique and personalised item to help you remember the next Hens Night you celebrate! Personalise our design with your Hen's name and message. A 57mm diameter badge, printed with one of our exclusive Hens Night design. Simple enter the text for your badge and submit the order via our online shopping cart. Got Your Own Badge Design? If you’re feeling creative, you may wish to place an order for custom made bages using your own design. If you’re savvy - download badge templates for Photoshop and Illustrator at our artwork page and get creative! Free Gift For Your Hen! 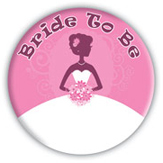 To help celebrate, MakeBadges will not only send you your custom made badge order, but will also include a Free 'Bride to Be', 'Mother of the Bride' and 'Mother of the Groom' badge with every order! Hurry - Limited quantities available.